Can a countertop add value? That depends on the material. Standard ones, the kind you’ll find in cookie cutter new home construction and on the shelves at your local Home Depot or Lowes are laminate- a composite material covered in a decorative paper and melamine coating. They’re definitely at their prime during the first 5 years of their life (or until someone forgets what a cutting board is for) and are prone to nicks, cuts and burns by regular use or accident. With careful use, they can look great for decades but very few make it through a growing family without taking a hit or two. Even a new laminate counter many not add the value you would expect since it’s the bare minimum that buyers expect. Solid surface and stone countertop options are considered to be definite upgrades and tend to add value because their function and lifespan are so appealing to Buyers. 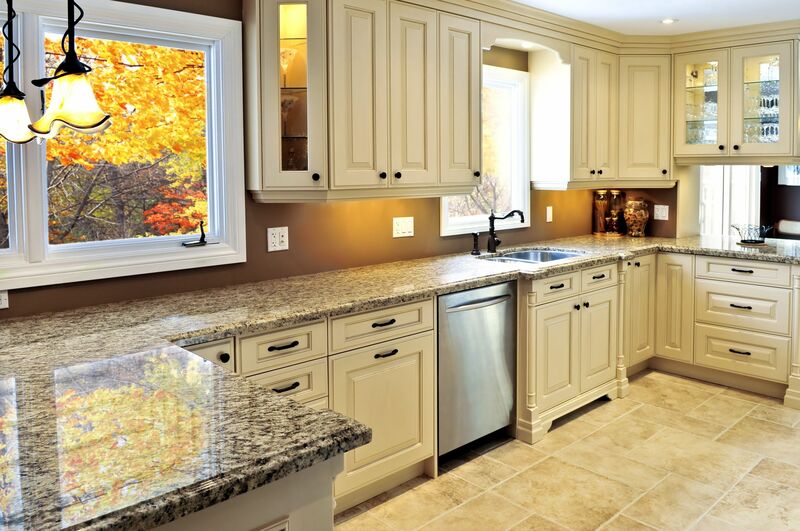 Most homeowners dread tackling kitchen renovations. The thoughts of spending tens of thousands of dollars and living without a functioning kitchen for a week or two can be overwhelming-emotionally and financially. The good news is that it may take you longer to select a new countertop than it will take to have it installed. Just like other renovation projects, the more prepared you are the better. Perhaps that new granite counter will be best served with a new under mount sink and that sink will probably be best served with a new faucet and maybe, that faucet is going to need new plumbing. You may want to accent your new countertop with new back splash and perhaps even a new slide-in range. The key is to make a plan and set a budget, keeping in mind that the end result will be well worth it. There’s absolutely no doubt in this Realtors® mind that decor and staging definitely helps sell a home, but one of the most fascinating trends I’ve seen over the past decade in the Hamilton real estate market, is Buyer attraction to quality countertops like quartz, granite and brand names like Corian and Caesarstone. And, it doesn’t matter what the price range of the home is, buyers seem to be willing to look past other issues when the kitchen and baths have awesome countertops. At first I thought it was a whole kitchen thing happening, but I don’t believe that’s the case. Seems like refurbished, painted or even original cabinetry take on a whole new life once they’re capped with a high quality counter. At $60-$90 a square foot, decking your kitchen out with quartz, granite or one of the other materials may seem to be an expensive option especially if you’re going to be moving out of the house in the near future. But then again- why wait until you’re moving? Select the right product and it’ll look just as good 5 years from now as it does the day you have it installed. The true value may be in you getting to enjoy your investment. If you’re going to start shopping for counters make sure you check out Dupont’s charging stations- one of the solid surface technologies we’re bound to see more of in the future. Check out the difference in countertop materials at Popular Mechanics! This entry was posted in Home Buying, Home Maintenance, Renovating for profit, Trends and tagged countertops, Donna Bacher, Hamilton, real estate, realtor, renovations, Trends by Donna Bacher, Broker. Bookmark the permalink.